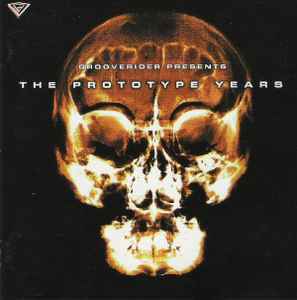 Grooverider Presents The Prototype Years. Tracklist for disc 2 is given on the tray, back cover lists only tracklist for disc 1. Track 2-14 is credited to "Dom And Roland with Optical"
Great compilation that has some amazing tracks on there – Silver Blade, Locust, Grey Odyssey, Secrets, Mute. And I think I’m right in saying that most of that lot were only on the album and never got released as singles. There’s also a number of tracks in the compilation from the Prototype 1990’s back catalogue that are worth checking out if you don’t own the singles. As someone else has said the Grooverider mix CD is pretty poor, his mixing in parts is really disappointing. A bedroom DJ with a reasonable amount of beatmatching skill could do a lot better than Grooverider’s effort here. Great album and considering it's oldskool era as it's from 1997 I think it still sounds as fresh today as it was back then so Grooverider has done a good job with this album as it stands the test of time and not only that as it never gets boring no matter how much you listen to it. An album flooded and plagued with nothing but wicked tunes and my favourites on here are "Secrets" from John B, the "Locust" tune from Ed Rush & Co (my way of putting it easier lol) and of course "Silver Blade" by the legendary Dillinja. The godfather of drum & bass shows us why he's called exactly that with this excellent album and some tunes sound more on the jungle tip than others but I like how Grooverider takes us on a non-stop drum & bass journey. Some of these d&b tracks to me sound quite dreamy and I like that on any album but more importantly Grooverider never ruins the album with cheesey tracks which I've witnessed by other artists but won't mention names. I thoroughly recommend this album to all those who are new to the drum & bass scene or music. Great tunes at their best and I've read reviews about Rider not mixing well on this album but I think he's done well so I ignore all negativity. This is one of the best drum & bass albums ever released and d&b probably wouldn't exist if it wasn't for Grooverider so all haters please jog on, grow up and show some respect... Great album from the best dj in the genre! John B. - Secrets. Nothing else. To this day. That track made D' n' B for me. It was all Drum n Bass had. It couldn't get heavier, funkier, dancier...Nothing else. And yes, to this day, the styles have evolved, for the better, for the worse. This track, singularly, will remain what it is: perfect.